The nose has bonfires of dry wood, lemongrass, and hints of coal dust. The mouthfeel is thin with no cling. The body has vanilla, lemongrass and ash from a coal fireplace. The finish has bonfire smoke, ash and a hint of lemon. Water brings out thin, lazy whorling that settles into brief mottling. The nose gains caramel and smokey toffees, and loses the coal dust. The body gains caramel, toffee apples, and more lemongrass, and loses a little of the ash in favour of dry bonfire smoke. The finish gains more bonfire smoke and some smokey toffee, and loses the coal dust. 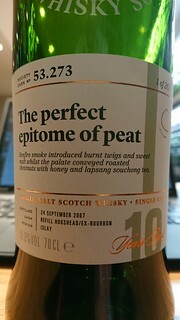 A superb example of this distillery, and a superb smoky whisky. What a dram. What a way to end the evening!